Santali is a language in the Munda subfamily of Austroasiatic languages, related to Ho and Mundari. It is spoken by around 6.2 million people in India, Bangladesh, Bhutan and Nepal, although most of its speakers live in India, in the states of Jharkhand, Assam, Bihar, Odisha, Tripura, and West Bengal. The following brief grammatical sketch is based on Ghosh 2008. It does not purport to give a full account of the language's grammar but rather give an impression of the structure of the language. Santali has 21 consonants, not counting the 10 aspirated stops which occur almost only in Indo-Aryan loanwords and are given in parentheses in the table below. In native words, the opposition between voiceless and voiced stops is neutralized in word-final position. A typical Munda feature is that word-final stops are "checked", i. e. glottalized and unreleased. Santali has eight non-nasal and six nasal vowels. Santali, like all Munda languages, is a suffixing agglutinating language. Three numbers are distinguished, singular, dual and plural. Santali has possessive suffixes which are only used with kinship terms: 1st person -ɲ, 2nd person -m, 3rd person -t. The suffixes do not distinguish possessor number. The personal pronouns in Santali distinguish inclusive and exclusive first person and anaphoric and demonstrative third person. The interrogative pronouns have different form for animate ('who?') and inanimate ('what? '), and referential ('which?') vs. non-referential. The demonstratives distinguish three degrees of deixis (proximate, distal, remote) and simple ('this', 'that', etc.) and particulate ('just this', 'just that') forms. The numerals are used with numeral classifiers. Distributive numerals are formed by reduplicating the first consonant and vowel, e.g. babar 'two each'. Verbs in Santali inflect for tense, aspect and mood, voice and the person and number of the subject. Transitive verbs with pronominal objects take infixed object markers. Santali is an SOV language, though topics can be fronted. A great recognition of Santali was reached in December 2013 when the University Grants Commission of India decided to introduce the language in the National Eligibility Test to prepare future lecturers for the language in colleges and universities. ^ "Santali: A Language of India". Ethnologue: Languages of the World. SIL International. Retrieved 16 January 2012. Ghosh, A. (2008). Santali. In: Anderson, G. The Munda Languages. London: Routledge. Hembram, P. C. (2002). Santhali, a natural language. New Delhi: U. Hembram. Mitra, P. C. (1988). Santhali, the base of world languages. Calcutta: Firma KLM. Зограф Г. А. (1960/1990). Языки Южной Азии. М.: Наука (1-е изд., 1960). Лекомцев, Ю. K. (1968). Некоторые характерные черты сантальского предложения // Языки Индии, Пакистана, Непала и Цейлона: материалы научной конференции. М: Наука, 311—321. Grierson, Sir George A. (ed.) (1906, reprinted 1967). The Linguistic Survey of India. Vol. IV. Delhi-Varanasi-Patna. Maspero, Henri. (1952). Les langues mounda. Meillet A., Cohen M. (dir. ), Les langues du monde, P.: CNRS. Neukom, Lukas. (2001). Santhali. München: LINCOM Europa. Pinnow, Heinz-Jürgen. (1966). A comparative study of the verb in the Munda languages. Zide, Norman H. (ed.) Studies in comparative Austroasiatic linguistics. London—The Hague—Paris: Mouton, 96-193. Sakuntala De. (2011). Santali : a linguistic study. Memoir (Anthropological Survey of India). Kolkata: Anthropological Survey of India, Govt. of India,. Vermeer, Hans J. (1969). Untersuchungen zum Bau zentral-süd-asiatischer Sprachen (ein Beitrag zur Sprachbundfrage). Heidelberg: J. Groos. Bodding, Paul O. (1929). A Santal dictionary. Oslo: J. Dybwad. A. R. Campbell (1899). A Santali-English dictionary. Santal Mission Press. Retrieved 26 August 2012. Macphail, R. M. (1964). An Introduction to Santhali, Parts I & II. Benagaria: The Santhali Literature Board, Santhali Christian Council. Bodding, Paul O. 1929/1952. A Santal Grammar for the Beginners, Benagaria: Santal Mission of the Northern Churches (1st edition, 1929). Col, F T (1896). Santạli primer. Manbhum. Retrieved 2012-08-28. Macphail, R. M. (1953) An Introduction to Santali. Firma KLM Private Ltd.
Muscat, George. (1989) Santali: A New Approach. Sahibganj, Bihar : Santali Book Depot. Skrefsrud, Lars Olsen (1873) A Grammar of the Santhal Language. Benares: Medical Hall Press. Saren, Jagneswar "Ranakap Santali Ronor" (Progressive Santali Grammar), 1st edition, 2012. Bodding, Paul O., (ed.) (1923—1929) Santhali Folk Tales. Oslo: Institutet for sammenlingenden kulturforskning, Publikationen. Vol. I—III. Campbell, A. (1891). Santal folk tales. Pokhuria, India: Santal Mission Press. Retrieved 2012-08-28. 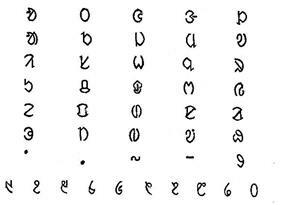 Santali Genesis Translation. Retrieved 2012-08-28. The Dishom Beura, India's First Santali Daily News Paper. Publisher, Managobinda Beshra.